Festive season is considered to be the most auspicious time to invest in your dream ventures, a beautiful home being one of them. It is a commonly followed practice to decorate homes during Navaratri which signifies positivity and blessings to the family. During Navaratri, the house is decorated and made attractive to the ones who visit the place. The guests are treated with an ample amount of food and warmth. Legend of Indian Mythology reads, Laxmi – Goddess of wealth, fortune, and prosperity – visits every home for blessings and stays in the home where peace and sanity exists. 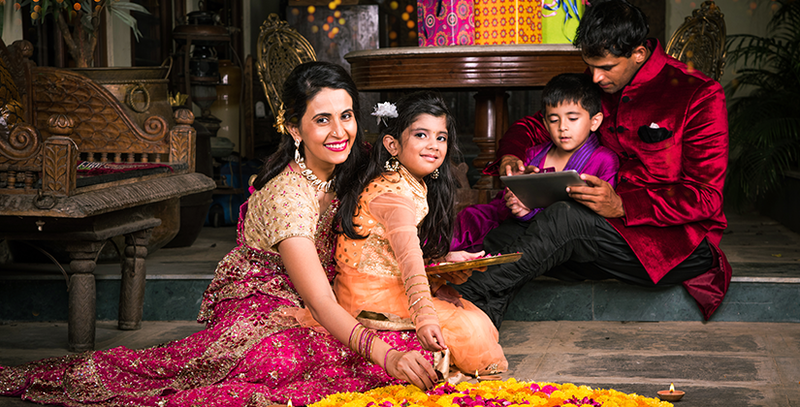 Decorations at home bring the family together in vibrant spirits topped with energizing and positive vibes. Residents begin with cleaning process prior to the start of the decorations. Here is a list of new ideas for your most auspicious festival of the year, Navratri. Laurel or Diwali Mala: It is a delightful convention in India to brighten the dividers and entryways of the house with wreaths. On the off chance that you can get to normal blossoms, you can make wreath and if not then fake blooms will likewise work for you. This craft requires finesse down to the nails! Rangoli comes in the form of powder where a finger-full is taken and drawn on the floor. This lovely craft also can be made in themes, plans and examples on floor. Making use of hues is a customary method for adorning home. Rangoli is a need of Navratri enrichment. It is believed that making it at the passage of every home resonates positive vitality. If you are in a rush, Rangoli stickers and stick-on Rangoli works best for you. One of the most essential and enhancing element in your house. You can decorate your home with green leaves to evade negative energies. In the event to save on gigantic decorations, Torans will always be a go-to choice. A hanging piece of marvel, Latkan, brings alive the propitiousness of the festival. You can choose latkan to decorate your house with a beautiful theme. Ensure you choose the right kind to meet your liking. A metal puja thali conveys the customary touch to your Navratri celebrations. You can also go for wooden thalis to give your home a remarkable look. Complete your thali with crisp blossoms. Create the picture of Durga with Moli or the red string that is utilized to wear on the wrist amid puja. A Kalash or Garba is more of a fascination on the outlook. Experiment with a brightened marble kalash this year for an interesting touch to your beautiful home. Some marble kalash models come along with semi-stones which add to the charm of your home. The ceiling art can add to the charm of your home hanging from the ceiling. This decorative piece is essentially the roof lighting that gives additional flamboyance to the house.